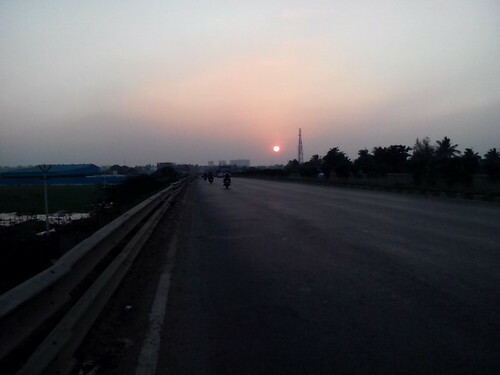 2 Pics Taken @ Chennai-Tambaram Bypass Highway! Loved the first picture, where the sun is so clear. Why is the highway so deserted? Because it’s sunday? My digital camera would have taken these shots better. I liked both the pictures. OK, light might not be enough but the scenery is beautiful. First one with the sun and the next, with mountains for a background. Nice. Mobile camera give better pictures sometimes than normal camera. Yes, but I think in low light my digital camera maybe better. It is great photo. It is great that you like twilight. Most of us do sins by displaying abilities. But it is truth. And Truth alone triumphs !! nice pics…..twilight gives some awesome pics! Yes, twilight gives awesome pics but not on my cellphone camera! Even I liked the first pic the most. Sun looks like a small orange ball. I always wonder why, when the sun is larger (when seen directly), the camera compresses it and makes it small?! yeah even I have wondered that. This applies for moon as well. Nice photos. 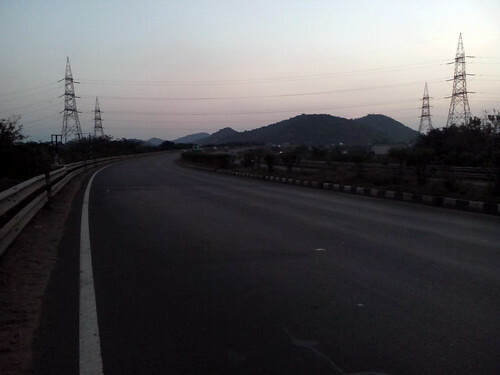 Could not imagine a Tamilnadu highway is this empty. It was a Sunday, and I waited for sometime before I could take a photo with an empty road! Beautiful capture! I liked the sunset image… i think this problem is in many mobile cams and we see more grains in them. Nice pic. What phone have you got? My fav part is the sunset. I’ve probably numerous pics of Sunset and I still can’t stop clicking when I’m out around sunset. Most of the cameras in the phones seem to take good pics only in natural lights. Excellent Clicks.. Keep it sharing! !